Carpal tunnel syndrome is a syndrome (a group of signs and symptoms that occur together and characterize a particular abnormality) that usually has as its main symptom numbness of the thumb, index finger, and long finger. The nerve that is involved is the median nerve (see illustration at right). Patients usually complain of numbness and tingling at night that wakes them up; often they can shake their hand and make it better. Numbness can also be a problem when driving, reading the newspaper or a book, or any activity that requires the hands to be held elevated for a period of time. 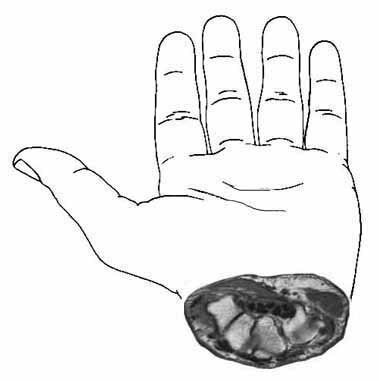 Patients often have pain in their hand, but characteristically it is hard for the patient to say exactly where the pain is located (this is not due to any fault of the patient's, but is a characteristic of compression on the nerve). There can be referred pain in the forearm, upper arm, shoulder, or higher. The presentation of symptoms is rather varied and overlaps other problems in the neck, shoulders, arm, and hand. There can be many other associated symptoms, but they are quite varied and can be confusing. Therefore, it is best if the diagnosis is made by a physician familiar with hand problems, such as a hand surgeon. In my own practice, about 50% of the patients who come in thinking that they have carpal tunnel syndrome in fact do not have it. I myself developed carpal tunnel syndrome as I got older (age 50). The symptoms got worse when I climbed El Capitan (6 days of hand-torture, I assure you!) at age 51, so I got mine released, both on the same day. I was driving the next day, saw patients in four days, and returned to rock climbing in 4 months. I climbed Half Dome (three days, less hand torture) the following year, and have never had a recurrence of symptoms. Read on! What is the Anatomy of the Carpal Tunnel? 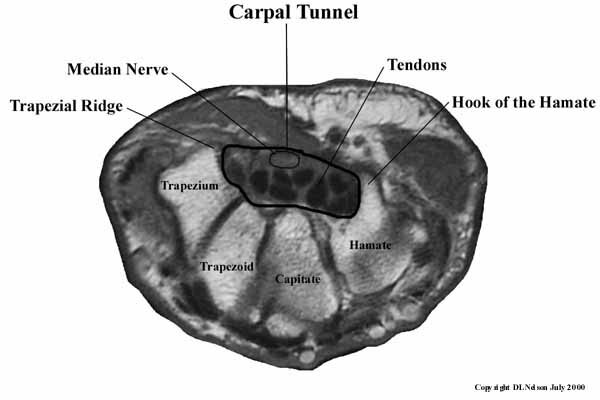 We need to understand the anatomy of the carpal tunnel in order to understand what causes it. Here are some diagrams that I have drawn to help you understand what causes it. 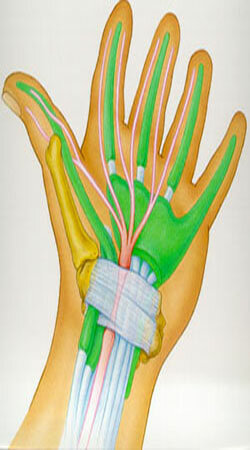 The carpal tunnel is located at the base of the hand, just distal (closer to the fingertips) to the wrist crease. It is important for you to know that the problem is not in the forearm: it is in the base of the hand. The physical cause of carpal tunnel syndrome is median nerve compression within the carpal tunnel which in turn causes decreased blood flow to the nerve. Here is a simple experiment to help demonstrate this concept (I probably had you do this in the office): pinch two fingertips together. Note how the fingertips go white, because you have squeezed the blood out of the tissues. This is the mechanism of carpal tunnel syndrome. Whenever you feel numbness in your fingers due to your carpal tunnel syndrome, you have so much pressure within the confines of the carpal tunnel you have squeezed the blood supply of the nerve so much that it cannot support nerve function. This increased pressure comes from swelling (edema) of the tissues surrounding the tendons called the synovium. This swelling may be due to injury to the synovium from overuse, trauma, or other causes such as metabolic disturbances (endocrine disorders, pregnancy, menopause). We are not sure of the mechanism of overuse, but it appears to be related to exceeding the material properties of the capillaries, somewhat similar to a paperclip breaking when you bend it back and forth too many times. The histology (examination of the cells of tissues under a microscope) of synovium in carpal tunnel syndrome from overuse has shown edema (increased fluids between the cells) and fibrosis (scarring in the tissue) apparently from micro tears. Contrary to what many people think, there is little (<5%) of tenditis in the tendons of carpal tunnel syndrome. Is Carpal Tunnel Syndrome Caused by Work? There is a clear answer: No, in almost all cases. It is it still covered by Workers' Compensation in California. The explanation will be fairly technical, since this is a technical question. According to the best evidence of the evidence-based literature (scientific studies that are properly designed and controlled), computer use does not increase the risk of developing CTS. Until recently, the two most referenced studies are the Mayo Clinic study (Stevens, Neurology, 2001, 56:1568-70) and the Danish study (Andersen, JAMA, 2003, 289:2963-69). The Canadian study (Watts, Can J Plastic Surgery, 2003, 11:199-201) concluded that “an extensive literature review revealed that there is minimal to no evidence to support the view that CTS should be a compensated claim.” They found that many of the decisions to cover CTS as a Workers’ Comp claim were not evidence-based (that is, based on science), but were policy-based (that is, based on governmental public policy decisions). A recent study, indicated as the Swedish study (Atroshi, Arthritis and Rheumatism, 2007, 56:3620-25), concludes that intensive keyboard use at the workplace is associated with a lower risk of CTS. The newest study (Lozano-Calderon, JHS, April 2008, 33-A: 525-538) evaluated 117 English language published articles from the National Library of Medicine’s PubMed data base regarding the etiology of CTS. This review and analysis of the literature concluded that “the etiology of CTS is largely structural, genetic and biological with environmental and occupational factors, such as repetitive hand use, playing a minor and more debatable role. There is insufficient evidence to implicate hand use of any type, typing in particular, as an important and direct cause of CTS.” At risk occupations for development of CTS include meat processors, fruit packers, aircraft and auto assembly workers and those jobs requiring prolonged vibratory equipment use. There are no studies reported that show an increased risk of CTS by typing or computer use. The current scientific and medical studies seem to verify that there is no increase in CTS among computer users versus the general population. The evidence is inadequate to implicate occupational factors in CTS. However, it is still covered by Workers' Compensation in California. That is, as a matter of public health policy, the Workers' Compensation System has decided that carpal tunnel will be covered as a workers' compensation claim, even though it is not caused by work. This means that returning to the same job will not cause the carpal tunnel to recur. This is complex, but I can explain it to you when you are seen in the office. What Can You Do about Carpal Tunnel Syndrome? 1 Diagnosis: We have to make sure that we are really dealing with carpal tunnel syndrome. Remember, many patients are referred to me for carpal tunnel syndrome that actually have another problem. 2 Patient education: So that you can take charge of your own health! This website is an important part of patient education, and we spend a lot of time on this in the office. 3 Activity modification: This approach can be quite effective, if it can be applied, but many times it cannot. If your problem is from a combination of fairly normal (but possibly rather vigorous) use, coupled with normal aging processes, it may not be a very effective approach. We will discuss your particular situation in the office. 4 Anti-inflammatory medications, splints, hand therapy: Night time splints may help with night time symptoms, but rarely are effective enough on their own. Splints during the day may be somewhat helpful, but they are rather obnoxious to wear, most patients give them up after a while, and rarely are effective enough on their own. Hand therapy is about the same: helpful, rarely completely effective. Antiinflammatory medications are the same. One interesting question is why they help at all, if this is not an inflammatory problem. It would apprear that they help to stabilize membranes in the capillaries so that not as much fluid leaks out of them, decreasing edema. 5 Injections: These can be very effective, but usually not permanently. In fact, based on studies in the literature (Green) the best use of the injection may be to determine if you will have a good result from surgery. The injection can be done in a way that is almost painless. I am not saying this on my own: I am repeating what patients tell me about how they felt from one of my injections. I have a special technique; talk to me about it. Virtually every patient tells me that the injection hurt a lot less than they expected. 6 Surgery: I put two lines between Step 5 and Step 6 because we have now come to the big S word: "Surgery". This word frightens most patients, but it should not frighten you. The surgery takes about 10-20 minutes, can be done under a local or a light general anesthesia (according to patient preference), is an out-patient procedure, has few risks, and usually results in complete resolution of pain and (if you have not put it off until the numbness is constant) significant or complete resolution of numbness. It is still surgery, and may be considered major surgery by some; it does have risks, as does any surgical procedure. We should talk about the risks and your health in the office. A website is not an adequate place to discuss surgery, except to say that it can be part of the management of carpal tunnel syndrome. Many patients have carpal tunnel syndrome in both hands, and often both hands need surgery. You can have one hand done at a time, or you can have both hands done at the same time. Each approach has advantages and disadvantages, so please read on. Most everyone's first question is: How can I go to the bathroom if I have both hands done at the same time? This is a great question and one which we should discuss. It turns out: it is really no problem for most patients. I have been doing both hands at once for patients for over 23 years. I have asked 100% of the patients if going to the bathroom was a problem, and virtually everyone says that it is not a real problem. The first two or three days, one wipes very gently, but it is not a problem. Baby wipes can make the job easier and more effective, but it is not a problem. Also, I myself had carpal tunnel syndrome that needed surgery. I had both of my surgeries at the same time, and doing activities afterwards was not a big problem. With the right attitude, you can sail through. So, now that we have gotten over "the bathroom question", what are the advantages and disadvantages? One hand at a time: the advantage is that you have one good hand to do forceful activities, like lifting grocery bags or large cooking pots. The disadvantage is that you need two trips to the OR, two anesthesias, and two recovery periods, with an increased time back to work and recreation. Two hands at once: the advantage is you have only one trip to the OR, one anesthetic, and one recovery period (it also costs less, if you have a deductible or co-insurance). The disadvantage is that you do not have one hand to do forceful activities. However, almost all normal daily activities do not require force, and those few that do can easily be done beforehand (do your grocery shopping before surgery, open that tight pickle jar lid) or deferred for a few days. Eating, dressing, toileting, opening doors, and similar activities do not require much force and my patients report that they can do this kind of activity without much inconvenience. Even driving is not much of a problem: you slam on the brakes with your foot, not your hand, and turning the steering wheel does not take either great force or the use of your fingers (use the heel of your hand). Even my older patients who live alone have found that doing both hands was not a problem. Please click here and read the statements of my patients who have had this surgery. Think about what the advantages and disadvantages of each approach might be for you and discuss it with me during your visit. What Can I Expect the Results to be? (1) Patients who have numbness symptoms that come and go, but still completely resolve at some time during the day. These patients can expect that almost all of the symptoms will be gone the day after surgery. (2) Patients who have numbness all the time. If you have waited so long that you have some degree of numbness all the time (we call this "fixed numbness"), you will likely find that the night-time pain resolves within a day of surgery. The return of sensation is more complex situation. Your sensation is likely to improve to as good as it has been recently, and then over weeks to months, will probably improve even further. It is impossible to predict how much sensation will return, although it is unlikely to return completely to normal. This is why surgery is recommended before fixed numbness occurs. The earlier you have the compression released, the better your chances are of improving. If you have fixed numbness and have your carpal tunnel released, getting some minorly painful or unusual sensations in your hand a week or three after surgery is a good sign: it means that your nerve is waking up! It is a bit like your foot waking up after you have sat on it too long, although hands do not have as much unpleasant or painful sensations like a foot waking up. Predicting the future is impossible, so no one can predict what your recovery might be like. However, the past is an excellent guide to the future, and the above comments are based on what has happened in my patients in the past. This is a more complex question than the return of sensation. This is because here are many reasons why a hand with carpal tunnel may not feel as strong. It may be that the decreased sensation in the fingers prevents someone from knowing how tight to hold and object and that object is dropped more easily. With return of sensation or even a slight improvement in sensation, dropping objects becomes less of a problem. Some severe cases of carpal tunnel can be associated with atrophy in the little muscles at the base of the thumb. In most cases, this muscle will never fully recover. However, despite loss of muscle, function can still be preserved. In very severe cases I might recommend a tendon or muscle transfer to improve function. An additional factor is that patients who have carpal tunnel syndrome are in an age group to also have some level of arthritis of the thumb base. There may be no symptoms of arthritis, but a combination of effects (change in hand use, change in hand biomechanics) may allow the asymptomatic arthritis to become symptomatic. If a patient develops some thumb base pain after a carpal tunnel release, a standard treatment protocol (see osteoarthritis) will need to be done. Excellent question, but hard to give a concise answer. Most patients can drive the next day, even the bilateral release patients, but you will not be able to grip the steering wheel firmly and will be driving very gingerly. Wait until you feel confident that you are safe before you drive. The decision of when to drive is up to you. I have yet to find a patient who could not do most of their own self-care, such as dressing, the next day. Almost all patients, even the bilateral releases, can do their own bathroom care. I can remember only two patients in 30 years who could not do their own bathroom care. Most patients will return to light keyboarding, such as email, the next day. When you can return to a job that is principally keyboarding is highly individualized, but self-employed patients return to full-time keyboarding anywhere from Day 1 to Day 7, non-self-employed patients return to work from 1 to 3 weeks. Manual labor patients return anywhere from 2-4 weeks to 4 months. The more forceful, the more jarring, the more pressure on the palm, the longer the return to work. Almost all patients experience some pain in the base of the hand, in the muscles that move the thumb and the fifth finger. These muscles form two bulges in the hand, or pillars. Therefore this pain is called "pillar pain." Pillar pain is caused because moving the thumb or the fifth finger in a palmar direction fires these muscles, and these muscles then pull on the incision, on the inside, where you cannot see. The degree of pillar pain varies, and usually slows you down somewhat but does not prevent you from gently using your hand. Also, because these muscles do not fire when you are lifting something like a grocery bag, generally patients find that they can lift a light bag of groceries right away, but their ability to hold a pen is a bit painful, due to pillar pain. In my 30 years of experience, all patients have had full resolution of their pillar pain. Most of the pain will be gone by 3 to 4 months, most patients do not experience it much after that time. Remember, recovery from surgery is highly variable. If you want to read what real patients have experienced, a number of my patients who have had surgery have recorded their comments and experiences here. If you are thinking of having surgery, especially if you are wondering about doing both hands at the same time, you should read that page. Some patients have heard about Endoscopic Carpal Tunnel Release, a form of endoscopic surgery. Dr. Nelson is quite familiar with this technique, but does not recommend it. For more (a very complex question), click here.